Popcorn is calling. It’s time to sit back and relax. 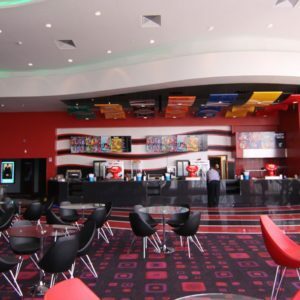 The Cinemas offers an island of rest with six state-of-the-art auditoriums, showing the latest movies on the big screen every night. During the summer months, the Cinemas opens daily at 12 PM. Saturday and Sunday Matinees can be enjoyed the rest of the year. Day or night, the wide range of hot snacks and refreshing drinks will surprise you.